Are small groups new? This book provides a historical backdrop to much of what is happening in cell groups and house churches today. It points us to valuable lessons which the modern church can learn from history. 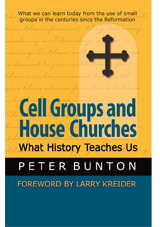 Examine how cell groups and house churches developed in the centuries since the Reformation. Explore the writings and practices of the Reformers such as Luther and Bucer, as well as the Pietists, Moravians, Methodists and others. These writings show clearly that when God moves in restoring His church, there is a renewal of small groups to aid discipleship and growth into holiness, often resulting in a greater concern for reaching the lost.